Khadro-la at Tushita Meditation Centre, McLeod Ganj, Dharamasala, India, March 9, 2014. Photo courtesy of Tushita Meditation Centre. Answer: In Dharma [potential], there is no difference between men and women. The nature of delusions, the nature of clear light and the antidotes to be applied are the same for men and women. In physical aspects, there are differences, but, in Dharma practice, both have the same capabilities. I would say that women are more suited to being leaders of countries because they have an innate sense of care and would more willingly embrace other countries. 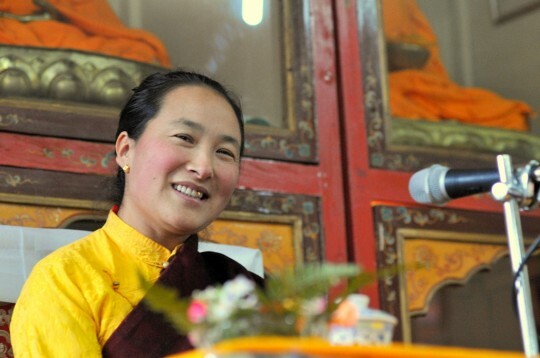 For the practice of bodhichitta, women have a quicker potential to actualize that because of this deep sense of caring and sacrificing for others. Whether the men support women or not, the buddhas and bodhisattvas support us! (laughter) And when the Buddha taught, he taught by referring to mother sentient beings and not father sentient beings! (more laughter). But yes, some women do have narrow thinking and cling to small issues. Better to be broad-minded and think at a higher level. Teaching given by Khadro-la at Losang Dragpa Centre, Kuala Lumpur, Malaysia, July 16, 2009. Lightly edited for inclusion in Mandala. An exclusive interview with Khadro-la can be found in the January/March 2009 issue of Mandala.